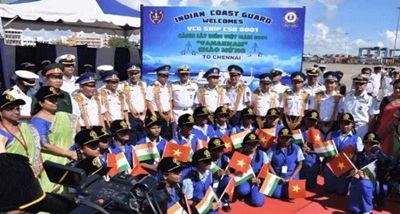 A Vietnam Coast Guard ship, on its maiden visit to Chennai, undertook joint exercises with the Indian Coast Guard off the city coast today aimed at strengthening the working level relationship between them. The exercise was aimed at acquainting the coast guards of the two countries with each others' capabilities and strengthening the working level relationship to rescue lives at sea. The highlight of the exercise was a scenario of hijacking an oil ship and subsequent rescue of its crew in the coordinated joint operation of both the countries. The exercise was conducted under the supervision of Inspector General Paramesh Sivamani Commander Coast Guard Eastern region, and was witnessed by Vietnam Coast Guard Commandant Major General Nguyen Van Son, the release said.